The Round 2 field is set after 12 final preliminary matches on Thursday. Of the matches, seven were decided in sweeps, four went four sets and just one went the distance. At the end of the day, the Netherlands, Italy, the United States and Serbia wrapped up the preliminary round with perfect 5-0 marks and pool titles. Bulgaria, the Dominican Republic and Mexico earned the final spots in the second round. Mexico made it through care of an Argentinian win over Cameroon, despite being swept by the Dutch. The round 2 matchups are set. Pool E, which will play in Nagoya, includes Brazil, the Dominican Republic, Germany, Japan, Mexico, the Netherlands, Puerto Rico and Serbia. Azerbaijan, Bulgaria, China, Italy, Russia, Thailand, Turkey and USA will compete in Pool F in Osaka. The lone five setter of the day was a battle for the top spot in Pool C, with the United State rallied for the victory to go 5-0. The Americans won despite trailing in kills (72-68), blocks (15-13) and point off errors (14-11). The USA edged the Russians in aces (5-4). Nataliya Goncharova turned in a match-high 36 points, including 35 kills and a block for Russia. Kseniia Parubets (16), Irina Fetisova (14) and Irina Voronkova (13) also added double-digit efforts. Fetisova put up a team-high eight blocks, while Irina Koroleva chipped in four stuffs. 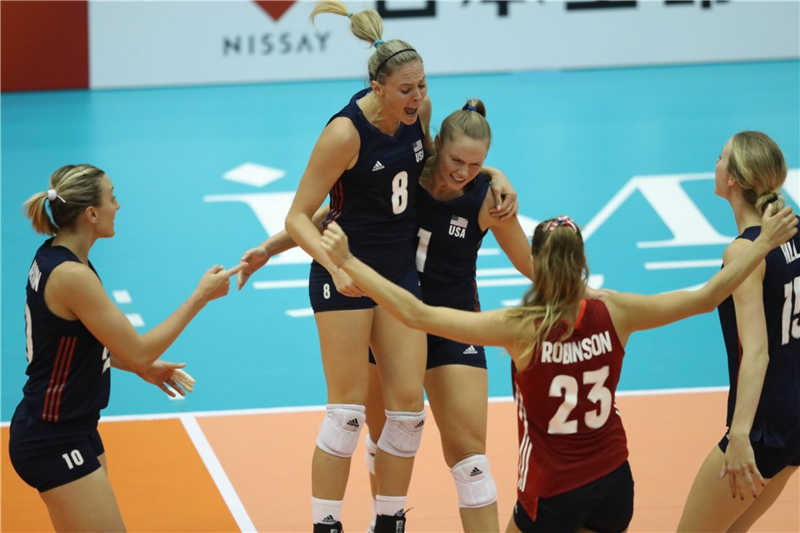 Kim Hill (19), Jordan Larson (16), Foluke Akinradewo (16) and Kelly Murphy (14) led the way for the Americans. Karsta Lowe took over for Murphy in the final set and finished with nine points (8 kills, 1 block). Akinradewo led the team at the net with four stuffs, while Murphy added three. Hill led the way with 16 kills, Larson (15), Akinradewo (12) and Murphy (11) also added double-digit kill tallies. Goncharova downed eight kills and Parubets added seven in a 25-19 Set 1 win for Russia. The Americans bounced back in Set 2, going up 19-12 and holding off a late Russian charge for a 25-20 win. Akinradewo and Lowe paced the offense and Wilhite starred from the service line as the USA edged out a 26-24 win in Set 3. Russia grabbed a 16-7 lead in Set 4 behind Voronkova and Fetisova. The team followed Koroleva and Parubets down the stretch to a dominant 25-12 victory. The USA turned the tables, jumping ahead 8-3 in Set 5. A stuff by Lauren Gibbemeyer made it 12-5 after a Russian timeout and a Parubets hitting error sealed the American victory at 15-11. Korea’s Jeongah Park tried to take her team’s fate into her own hands, delivering 26 points in a sweep of Trinidad and Tobago. South Korea got the win, but fell short in advancing to the second round, finishing 1-4 in Pool C.
Park notched 26 points over the three-set affair, including 24 kills and two aces.